Mono Tweed Knit Longline Jumper is rated 4.0 out of 5 by 4. Update your wardrobe with our longline lightweight jumper. 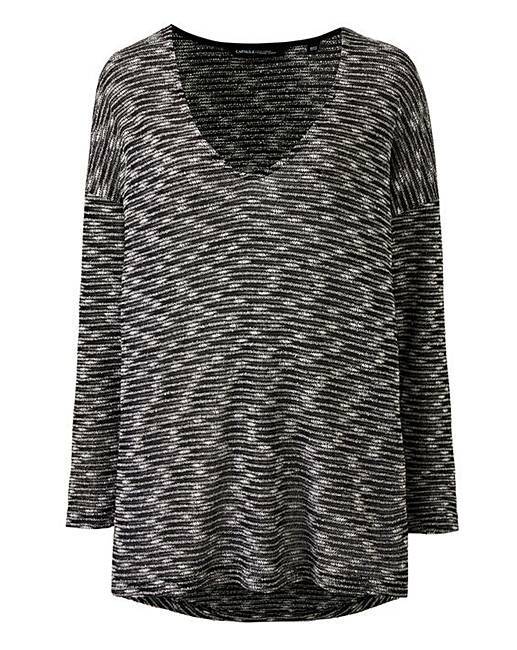 With a dipped back hem and a flattering V-neckline, this jumper is a go to piece for this season. Rated 5 out of 5 by littlebear from comfortable and easy care Ideal for office wear as the lovely soft material is not too heavy and ideal under a winter coat. Ideal length for wearing with trousers or a skirt. Easy to wash dried quickly hanging in a warm room, no ironing required. Just wish there were lots of colours. Rated 4 out of 5 by Andy Pandy from Good buy Bought a while ago and still washes well, not as long as I expected though but still a good buy. Rated 2 out of 5 by Kat86 from Lovely to wear I bought this top a few weeks ago, great to wash and wear, ie no ironing, personally not so keen on the longer material at the back than the front but that’s just my preference. Love the material and colour but after only a few washes it has started to go bobbly which is disappointing as it looked like this would last a lot longer than it has. Rated 5 out of 5 by Babybug from Nice light weight top Lovely light weight top. Easy to wear. Dress up or down.